WARNING: Google Is Dying , and Your Online Business is About To Die With It! Google, and there's absolutely nothing almighty Google can do about it! Independent studies reveal that FaceBook, Twitter and other social media services will completely replace Google as the main source of web traffic in the near future..
Read this page very carefully to discover how you too can cash in on social media traffic, even if you're a total newbie and have absolutely no idea what "social media" means.. I know you've been working hard.. real hard. I know you've been desperately trying to break free of the rat race, build an online business, and give your loved ones a better future. But you've made a big mistake in the past that is about to destroy everything you've worked so hard for. Your BIG mistake: You put too much faith in Google. You thought that Google will be here forever. You assumed that if you did what Google told you to do - changed your entire business model to match Google's confusing "terms of Service" and literally kissed their almighty asses - Google might see it fit to reward you with a Top 10 search result. But how did Google reward you? Penalties and low rankings. Google slaps. Banned AdWords accounts. Lousy customer support. And yet, you tagged along with all the other desperate marketers, eager to do whatever needs to be done to please your almighty master. Don't get me wrong: I'm NOT talking down to you. I'm merely describing myself, and how my dependence on Google brought me to my knees and almost destroyed my future. If you're like me, then you should take joy in an undeniable fact - Google is yesterday's news. Today, social media sites like FaceBook and Twitter are fast become HUGE sources of active, ready-to-buy traffic - and getting them is nowhere as difficult as trying to understand Google's "algorithm" mumbo-jumbo. "But I never paid much attention to social media before - is it too late to get started now?" The simple answer: Absolutely not! Today, getting traffic from social media sites like FaceBook and Twitter is easier than it has ever been. You have at your disposal tons of tools and free services that you can use to get maximum traffic in minimum time. There's only one catch: You need to do it right. 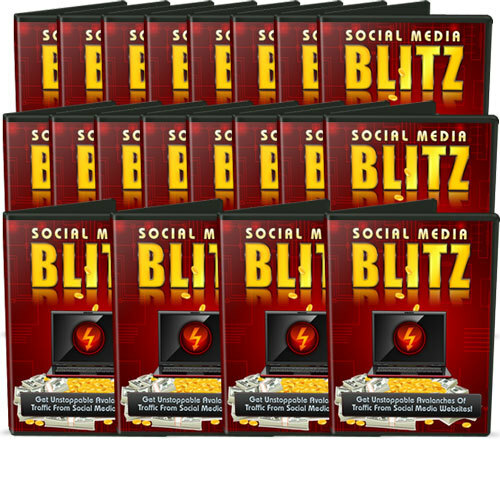 With the "Social Media Blitz" package, we're prepared to guide you step-by-step in getting started with social media. Even if you're already using social media, you will still learn a thing or two from our video tutorials. 22 Step-by-Step Social Media Video Tutorials!